A few weeks ago I mentioned that I ran into a bug relating an invalid MDS url while trying to create an XSL based on the Case.xsd. Just this morning got a notification on my Service Request that there is a patch for an invalid MDS url while creating an XSLT based on the Case management XSD: 19775314. There are two versions of the patch: one for the 12.1.3.0.0 and one for 12.1.3.0.1 for homes that have the bundle patch applied. I tried the second one on my BPM QuickStart home that was patched with the bundle patch. 20163149: (dataobject assignment lost after dehydration), this is mentioned as a prerequesite to the bundle patch, as alternative to the wrongly mentioned patch in the Readme. 19706799: db adapter wizard mappings and xsd file creation does not trigger event in win (Patch); choose the 12.1.3.0.1 version. So I won't bother to do a how-to on that on my account. Although I manged to get that working with a local Exchange setup. What I managed to do is to read e-mail and then process it to upload the attachments and body using BPEL and java in a Spring-Context to Adaptive Case Management. If you want to do something similar make sure you install the patch 18511990 for fetching the attachment-properties and -content, since without the patch the properties for inline attachements are not written properly to the soa-infra database. See my earlier blog-posts here and here. Having it all setup and playing around with it, you might end up in the situation that the service won't listen to the actual email-address you reserved for it, as I did. This might be the case when you change the email address in your receiving adapter component in the composite. Or after deploying several versions of the composite, especially with different addresses. 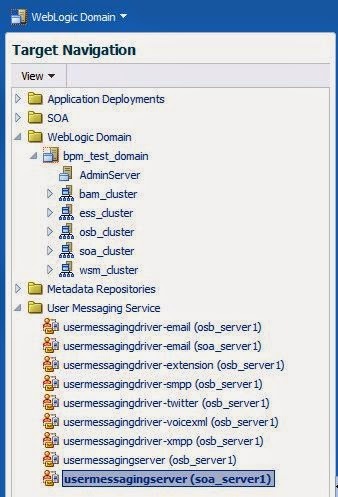 It turns out that there is a panel to deregister Messaging Client Applications to cleanup the mess. 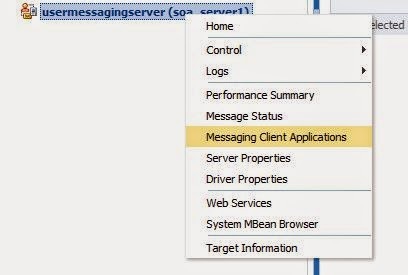 Here the registered Messaging Client Applications are registered with the particular endpoints. In our case all the activation agents of the polling inbound email adapters are registered here and it the situation might occur that the composites are listening to wrong addresses. So select those you don't want anymore, and click on the De-register button. You might need to re-deploy your composite and edit the component for the inbound email to have it listening to the proper address set-up for the particular environment (development, test, accepetance, production). And then it shoud work. Maybe a server restart is necessary to have the proper activation agent(s) started (and the unwanted shutdown).